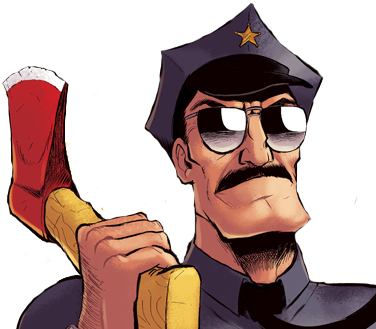 the Axe Cop Christmas Special! The Snoward family had 1,000 children at one time, but they all died when one of the kids ate too much food which gave him a mysterious deadly cough that spread to all the other kids and all 1,000 of them died. After grieving the loss, the Snowards decided to adopt a child, so they adopted Uni-Baby (after she lost her unicorn powers). Avocado Soldier was so saddened by the Snoward family's story that he used his unicorn magic to bring all 1,000 of their kids back to life, and he gave them "2,000 million more". With so many new kids, the Snoward family was too big for earth, so Avocado Soldier also used his unicorn magic to give them a snow planet and a bunch of snow shovels where they now live in igloos. Powers: rapid reproduction.